This was exactly what I was looking for! ... If only I could find Eyal Yovel's demo code. We use Serenity BDD at work, an automation framework that is mainly a web testing framework. For months I tried to turn it into being a mobile automation framework to test mobile apps. All this Spring, I spent trying to get working other proof-of-concepts others had toyed with, to no avail. Mobile automation? It seemed unsupported by the Serenity BDD Google Groups, and still remains undocumented in the official Serenity BDD documentation. Then I stumbled upon a European webinar announced by Sauce Labs... that was being held at 5:00 am Boston time. Normally, there would be a recording published a few days later. But what if this time was different? I couldn't take that chance! Slides for One Test to Rule Them All! 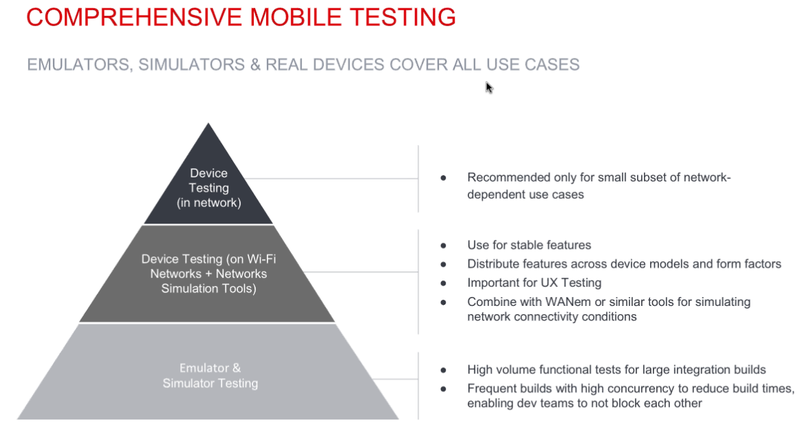 "More and more companies deciding on mobile test automation are turning towards Appium. While it is very popular and its adoption is growing, it is not an easy task to implement a robust testing solution that is both cross platform and built to scale. This webinar will explore how to build a mobile testing strategy based on Appium and BDD. "Join Asaf Saar, Sauce Labs Mobile Product Management Director, and Eyal Yovel, QualiTest Senior Test Consultant, as they discuss how a mobile testing strategy and the proper application of Page Object patterns can help leverage Appium’s power to produce concise, readable, and maintainable automated tests for both Android and iOS. "You will also see a live demo of a framework running Appium tests on iOS and Android"
The biggest takeaway? I have been trying to decide, as I come up with a mobile automation framework: Emulators? Or real devices-in-the-cloud? According to what they talked about, emulators for smoke tests might actually be fine.